Hu Min took a bit of dough, shaped it into a three-centimeter-long column, pressed one of the ends flat, and cut four small openings in a row on the flat end, then turned it into a delicate hand with his nimble fingers in a matter of seconds. 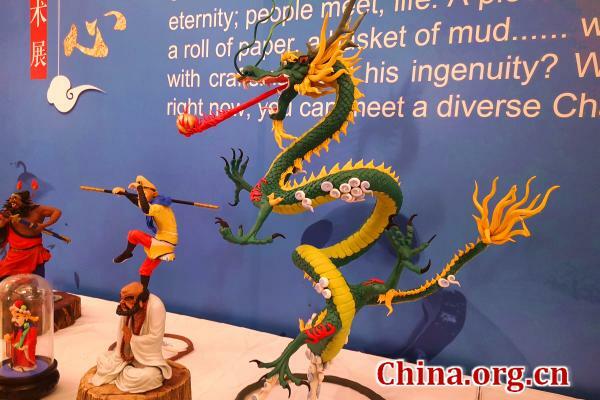 The 35-year-old craftsman demonstrated at his stand how he makes the most delicate part of one of his dough figurines, one of China's four ancient beauties Yang Yuhuan, on April 1. 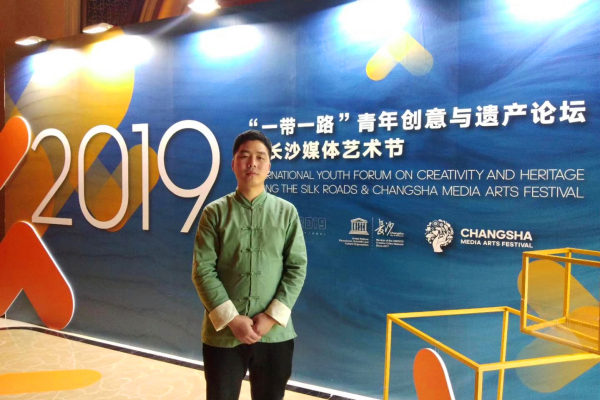 The Third International Youth Forum on Creativity and Heritage along the Silk Roads (IYF3) kicked off in Changsha, Hunan province on March 31. Youth delegates from 85 countries discussed creativity and cultural heritage. Hu's stand was one of the several stands which featured dough figurines at the high-level forum of the IYF3. Made of strong flour, the figurines on Hu's stand represented many well-known historical or cartoon figures in China and abroad. Besides Yang Yuhuan, there was also Guan Yu, a general from the Three Kingdoms period (220-280) and widely revered by the Chinese. The popular cartoon character Peppa Pig also appeared on the stand. Apart from the latest cartoon figurines, Hu took one-month last year to produce a boat scene named Batu Hitam. As Changsha is positioning itself as a key location in China's Belt and Road Initiative, Hu looks to incorporate more Belt and Road elements into his crafts. After the discovery of the Batu Hitam shipwreck, which was found off the Belitung Island, Indonesia in 1998, people noticed that among all the porcelain wares rescued from the shipwreck, a total of 56,500 were from Tongguan Kiln. The Tongguan Kiln is one of the three largest kilns for exports in China's Tang Dynasty (618-907); it is located in Tongguan Kiln Town, Changsha, where the forum was held. The set of the Batu Hitam dough figurines is a prosperous trade scene between Chinese and Arabian merchants at a port. Hu said, in doing so, he tried to note down the history with the crafts and promote Changsha. In addition to being creative, Hu said the skills of traditional crafts have also improved with time. For example, the craftsmen would improve the formula of the figurine dough with their experience. In the past, these figurines were used mostly in sacred ceremonies, but now, they have become art wares or souvenirs that people would like to keep for longer, so more food additives such as preservatives are added to the dough. Hu said some dyes and pigments are being used now, replacing food coloring which was used in the past; the dough figurines may not be edible, but can be preserved for longer and look more vibrant. When Hu was a kid, he liked to play with mud to create various kinds of figurines. When he grew older, he bought many dough modeling books to educate himself. In 2005, he received systematic training. Hu admitted that inheriting the handicraft skill was not easy. It takes a long time for a person to master the craft, and bring few instant material rewards, he said, adding that many people quit along the way. Hu turned his hobby into his career and founded his workshop in Changsha in 2015. This leap forward in his life also won him an award in an entrepreneurship competition in his hometown Ningxiang, a township under the administration of Changsha city. Hu said making dough figurines is a hobby for him, which is why he can go this far. Now, he often goes to teach dough figurine classes to kids in kindergartens, students in primary and middle schools, and people in communities. He teaches the community, in the hopes that more people will admire the craft and carry it forward in the digital age. "Making dough figurines is an activity that can cultivate their ability to focus, to discover and make beautiful things, and to create, especially for kids," Hu said, adding that as schools are putting more emphasis on cultural experiences, more classes and workshops on such intangible cultural heritage are becoming available to students; dough figurines are gaining more popularity among the kids. 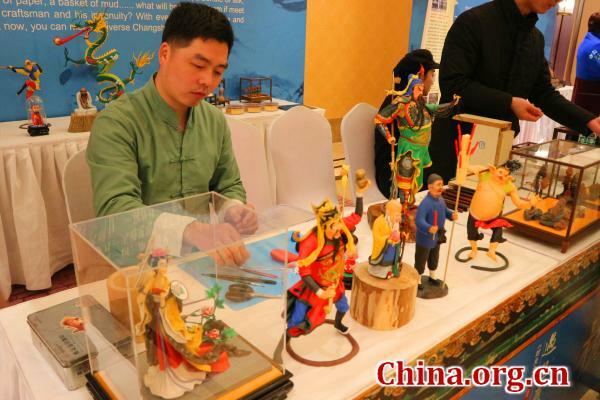 "The awareness of the general public to value handmade products is also increasing," Hu said, highlighting that as the government attaches more significance to intangible cultural heritage, more exhibitions and promotional events are being held. A young craftsman from Changsha, Hunan province is trying to carry forward traditional dough figurine skills, one of China's national intangible cultural heritage. He is doing so by adding more creativity to the craft and inviting more people to pick it up as a hobby.